New Hampshire running back Nico Steriti (22) runs past Maine linebacker Vinson Givans (4) for a touchdown during last season’s game at Cowell Stadium in Durham, N.H. UNH beat Maine 30-27. The two teams will meet for the 100th time at noon Saturday at Alfond Stadium in Orono. ORONO, Maine — There’s something about a rivalry game that brings out extra intensity and emotion from the combatants. 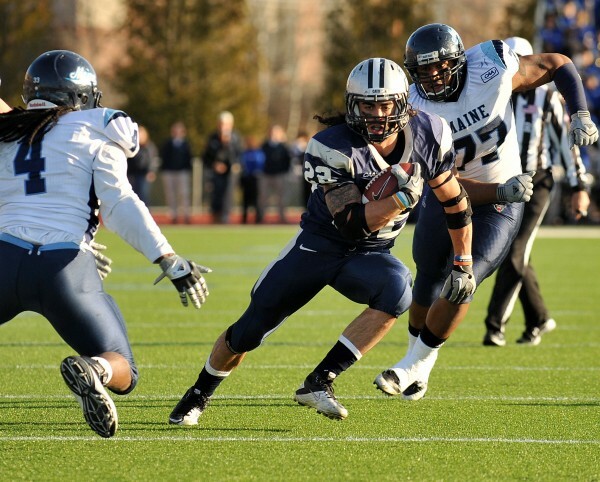 For the University of Maine football team, there is no more anticipated game than its annual battle against the University of New Hampshire. On Saturday, the two programs, who for the last few years have carried the banner for northern New England’s Division I Football Championship Subdivision teams, will meet on the gridiron for the 100th time. New Hampshire Wildcats (5-2) at Maine Black Bears (2-4), noon, Alfond Stadium, Orono: It’s Homecoming for UMaine and there should be even more excitement than usual on Morse Field as the Black Bears and Wildcats celebrate their 100th meeting. UNH leads the all-time series 48-43-8 and has won eight of the last nine in the series. The programs first played in 1903, squaring off twice. Both were UMaine victories. The last four games have been decided by four points or less. The musket is the Brice-Cowell Musket, named after former UMaine coach “Foxy” Fred Brice and former UNH coach Bill Cowell. The flintlock rifle, made in Maine during the early 1700s, is the trophy retained for the next year by the winner. “It’s definitely a big emphasis this year and we’re really focused on getting it,” Spearin said. The 12th-ranked Wildcats, who have made eight consecutive FCS playoff appearances, are expected to give UMaine all it can handle with a productive, multifaceted offense. UNH ranks fourth in the nation in total offense, racking up 499 yards per game while scoring 38.7 points per contest. The Wildcats nearly balance out the run (260 ypg) and pass (240 ypg) behind quarterback Andy Vailas (115-for-194 passing, 1,430 yards, 16 touchdowns, 3 interceptions). His favorite targets are R.J. Harris (46 catches, 665 yds., 7 TDs) and Joey Orlando (32-364-5). The ground assault features Nico Steriti (96 ypg, 6 TDs) and Jimmy Owens (49.9 ypg). “Nico Steriti is a tough, hard-nosed player, they have one of the toughest, most dynamic kids in the league in R.J. Harris and Joey Orlando is as consistent a wide receiver as there is in the conference,” Cosgrove said. UMaine counters with a defense that has given up 355 yards per game, including 187 via the run. However, the Bears have surrendered only 22.2 ppg. Linebacker Donte Dennis (59 tackles), safety Khari Al-Mateen (41) and linebackers Troy Russell (35) and Troy Eastman (32) head the UMaine unit. The UNH defense has been somewhat forgiving, allowing 30 points and 414 yards per outing. Even so, the Wildcats have found ways to make up for that by generating turnovers, including 11 interceptions. The Bears’ QB is Marcus Wasilewski (124-for-206, 1,371 yds., 7 TDs, 5 INTs), who has directed a solid but unspectacular unit that has put up 22.2 points and 372 yards per game. Tailbacks David Hood (73 ypg, 2 TDs) and Rickey Stevens (69 ypg) head up the run attack, while Wasilewski’s most productive receivers are wideouts Maurice McDonald (38 receptions, 327 yds., TD) and Derrick Johnson (29-340-2). BEAR TRACKS … UMaine hopes to have junior safety Jamal Clay back after he was hurt early in the loss at Towson. Junior transfer Lamar Fitzgerald is the backup. Husson Eagles (1-5) at Norwich Cadets (4-2), 1:30 p.m., Northfield, Vt.: The Eagles are on the road looking to snap a three-game losing streak in Eastern Collegiate Football Conference play. Norwich has cranked out 26.5 points and 430 yards per game, including 263 ypg on the ground. Massachusetts Maritime Buccaneers (3-3) at Maine Maritime Mariners (0-6), noon, Ritchie Field, Castine: The Admiral’s Cup is up for grabs once again as New England’s Maritime schools clash in a New England Football Conference Bogan Division matchup. The Mariners may have a tough time trying to stop a Buccaneers offense that has accounted for 33.5 points per game with a productive passing attack that has netted 333 ypg. Maine Maritime has not been tremendously productive with its option offense (13.7 ppg) and ranks last in the NEFC while allowing 41.2 ppg. Saturday’s other games: Hamilton (1-3) at Colby (0-4), noon; Bates (2-2) at Middlebury (4-0), 1 p.m.; Trinity (4-0) at Bowdoin (1-3), 1 p.m.